This year’s AID & Me asked how the ideas we gain through AID can influence everyday decisions we make. Can we segregate AID from our lives? Should we? Does e-activism make any difference? Watch the cast toss around these questions and poke good-natured fun at the year in AID. Why is women’s equality so hard to fathom? Sometimes I am just stunned … because when you think it can’t get worse, it does. What do children study in social studies? Sangati is a program that encourages children to study society, starting with themselves. Avehi-Abacus has trained teachers in more than 900 schools of the Bombay Municipal Corporation to implement this program. I had the opportunity to visit some of the classes during their Sangati session. “Was Dronacharya a great teacher?” (क्या द्रोणाचार्य महान गुरु थे?). I read some of the textbooks and teacher’s guides, including descriptions of their classroom exercises designed to facilitate introspection on questions of caste and gender. It would be interesting to try out these exercises ourselves in chapters. There is so much that we in AID can learn from this program, as travelers along the same journey towards a just society. 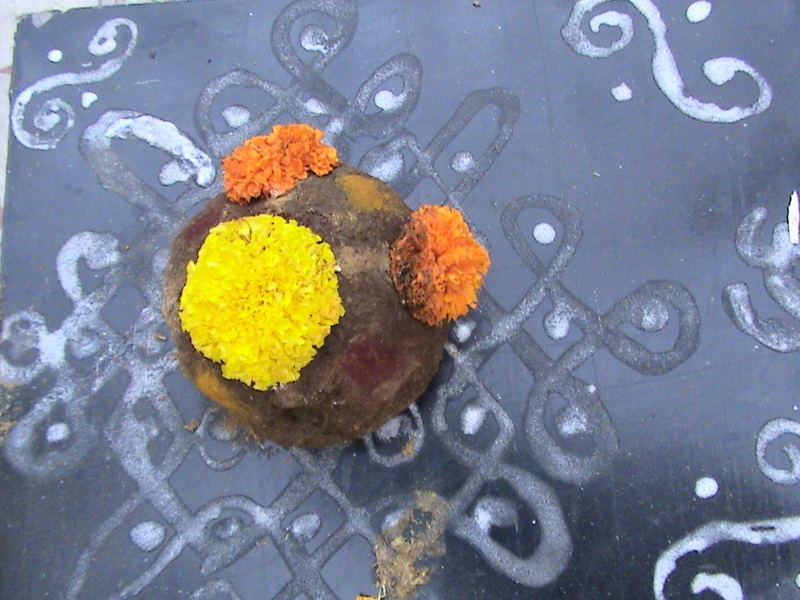 Gobbemma: Decorated Gobar Ball placed on Muggu. Since its founding AID has earned the trust of some of the most dedicated grassroots workers in remote and rural parts of India as well as in the poorer urban areas. Many individuals and organizations working on livelihood, natural resource, and human rights issues follow certain principles in how they raise support from the community. Only when AID has proven itself an understanding, and responsible member of that community, prepared to raise not only funds but also its voice, in solidarity with the people working for change, have these groups been open to accepting contributions from AID. Over the years we have learned to see the people whom we normally term poor and marginalized, as central to the processes of social change. We have also learned to relate to people informally, taking time to hear and understand their own ways of expressing their knowledge, experiences, and analysis of their problems and solutions, and offering our ideas and resources in a spirit of mutual sharing and reciprocity. If people like Aruna Roy, Arvind Kejriwal, Sandeep Pandey and Medha Patkar are taking AID seriously and taking volunteers into confidence, it is because they trust AID volunteers not only to answer requests for financial help from NGOs, but also to hear and understand people’s movements, to debate and further strengthen the vision as well as the fight for sustainable development, both strategically and ideologically. What kind of energy do we want, what is education, environment for whom, what model for socially responsible science, technology or business, what do we mean by sustainable agriculture, are a handful of the issues on which the elite and the non-elite need to work together and keep on trying to discover better and better approaches. It is our willingness as AID volunteers to go through the learning curve, to be ready to question and unlearn many of our long-held assumptions about what is good for the world or even what is good for ourselves that has helped AID as an organization become today one of the few of its kind that has been able to relate to the struggles and efforts of the poor, the marginalised and underprivileged communities without compromising on dignity and reciprocity. This means we have the courage to face those who ask, why are you opposing that dam, you should only focus on rehabilitating the affected people. Or, why are you getting into controversial issues when you could simply be educating people to work in the IT boom. When we take seriously the challenge to see ourselves as affected people, we are forced to evaluate our own role in the processes that empower and disempower people – ourselves and others. Because we recognize not only the right of every hungry person to have food, but also the right of every well-fed person to share the food produced by the economic system in which we take part, we can demand land rights, properly functioning Public Distribution System, National Rural Employment Guarantee Act, etc, not simply out of concern for those going hungry, but also as our own right and responsibility as citizens and as humans. Recognizing these rights and responsibilities, AID has held together the three aspects of development – sangharsh, nirman and seva without letting one dominate the other two, but rather seeing them intertwining. When we do any of these with full commitment, it will inherently open space or even directly involve the other two. Through our presence in India, we have strongly projected AID as an organization that backs its financial support with unflagging personal and moral commitment. We say to our partners, we are with you in spirit, we are there for you in time of need, we will answer when you call, we will share your successes proudly, and we will question authorities and raise our voices against injustice. When we talk to people like Chennaiah garu or Swati Desai, they are most moved by how personally aid volunteers take their commitment, sharing their views with friends and family who may disagree with them, patiently discussing issues with new people whom they meet at tabling functions, changing lifestyles and even livelihoods in order to work more wholeheartedly for the cause. We have a long way to go to live up to these promises. Today we find volunteers in every chapter, deeply inspired by AID. All of us need to work continuously and passionately to sustain this quality and depth of commitment, and the unity of sangharsh, nirman and seva. In the US, AID is a movement, raising the standards for the Indian community to connect with and be the change. Presented at West Coast meeting of AID held in the Bay Area in July 2005 and at East Coast meeting of AID held in Mohegan Lake, New York, August 2005. All of us agree that we need to work to improve the quality of our projects. By the term projects we loosely refer to our collaborations with individuals and groups in India but specifically mean our formal, financial support to registered organisations. To get beyond the us-them relationship: One way is to acknowledge and make it as reciprocal as possible. In the matter of improving our project collaborations, there are two sides to the coin. On the one hand we perceive that we must work with ‘better groups’ and have devised various criteria on which to evaluate the quality of an NGO, whether by degree of volunteerism, extent of mass base, gender balance, etc. We must also focus on improving ourselves. Remember that the leading groups that we have sought to work with over the years are also trying to improve their relationships with the supporting community. How would they evaluate AID’s role in providing support? Are we an organisation worthy of collaborating with these leading groups? It is important to respect this kind of committment and not seek to wipe it out with the magic wand of AID support. While we have earned the trust of some of these people and persuaded them to involve AID, we should not presume that this form of support is inherently or automatically superior to the more cumbersome processes. If there are reasons that the more grasroots approach to fundraising was not as successful as hoped, these reasons do not necessarily lie with any fault in that method. that this is seen as ‘taking a lot of time.’ There are no standard forms, spreadsheets or development lingo, but one must broach the topics afresh each time. People are by default in a rush, and have longer hours at work, longer commutes and less time at home. Many people who contribute to AID are in a sense delegating to AID volunteers the responsibility of attending meetings, studying issues, and forging strong collaborations with those who are working for social change. This itself is part of the problem. A society in which people can not spare the time to meet and discuss issues is more vulnerable to inequality, exploitation, restrictions on civil liberties, and and other problems that result when time and space to question is so limited that authority is strengthened and the questioners themselves are easily labeled and marginalised. So we do need to fight for this time and space and find creative ways to keep on involving the community in supporting causes and forming opinions on issues. This is as important if not more important than the funding of programs through institutional mechanisms such as AID. regularly responding to appeals, petitions, action alerts, and visiting eagerly just as we visit other places and people of our own interest? In which projects do we disappear until we are called upon for the next installment, like a deadbeat dad being sued for child support? Whenever we think about improving our projects, we should think in terms of improving our collaborations, and ask tough questions of ourselves as well as our partners. AID, that is, all of us, have to change the quality of our project support if we expect to improve the quality of projects we support. It is not enough to say, here we are, let the best projects to come to us. We also have to change ourselves. Because in fact the best grasroots development work is being done by folks with no funding at all, no organisation at all. Organisations play their role best when they sustain and build their links with the most grasroots, unorganised and unfunded development workers, those maintaining home and family, sustaining natural resources and keeping traditional livelihoods alive for the next generation. The farmers, forest dwellers, coastal communities, artisans, weavers, spinners, craftspeople are practicing the solutions for sustainable development and living lightly on the earth with least ecological footprint. When their communities, social fabric and natural resource base are intact, they are able to utilise the democratic structures such as gram sabha to plan and implement their own development projects, as well as tools like Right to Information to check and balance accounts and nip corruption in the bud. No central government or NGO program can come close to restoring livelihoods once they are lost and the most sustainable livelihood is land on which the majority directly depend for livelihood and all of us depend for life’s essentials. Putting our development work in perspective …. the kinds of activities we have normally counted among our projects and which the average chapter project coordinator eagerly leaps to adopt, such as a little vocational training here and schools, libraries, and clinics there are not going to make a significnat dent in the larger development issues, even if these are scaled up. Natural resources and livelihoods are the fundamental stakes and the people’s own voice in the development process is the key way to protect these. While doing so if they are able to access the resources and expertise of organisations such as AID in implementing any of the above programs then they have a much higher chance of being appropriately adapted and making impact immediately as well as in the long term. We must not give up on these questions … nor can we delegate them to anyone else. Each of us must answer to and for ourselves. should steadily meet and raise this standard of support that we expect ourselves to provide in our collaborations. — get project info in local langauges and use this to forge closer and more informal ties with the community that is invovled with the work of our partner NGO. — create a culture where people plan project visits before reaching india. Project Coordinator should work with chapters so that any interested volunteer visiting India gets advised on which projects s/he may be able to visit. S/he may then contact the project coordinator, the folks in India, fix dates and even book train tickets all in advance, thus saving valuable time in India which always seems to run out when people begin the ‘which project should i visit?’ process only after landing. — seek opportunities to support local livelihoods by buying village products esp when they are being produced or marketed by our NGO partners or other outlets. — systematically catalogue the various writeups, photos and videos that come out of project visits.